Presented by Ferlette Multivitamins and Coca Cola. Elizabeth Seton School, LP – After ten years of being away, most of them came home. The halls of Elizabeth Seton once again heard the playful chatter of boys who had been gone a long time, but have come back to where they all began. 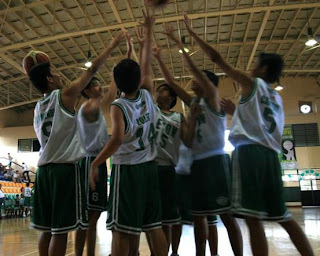 More than two hundred alumni, parents, students, teachers, friends and sponsors gathered together as one Seton community as they joined the opening festivities of the first-ever Elizabeth Seton Basketball League (ESBL) which opened at the Seton Gym last February 2, 2008. Eleven teams from different alumni batches, students and parents have come together to form the first lineup of teams in the league, each team bringing their own particular brand of character and style of play to the hardcourt. The lineup of teams consists of: Team Sunflex (PTA 1), Ezerra Legends (PTA 2), Coca-Cola Hornets (1996), Coca-Cola Wrath VHU (2004), Ferlette Seton (2008), Ellegy H20-2K7 (2007), Team Monterey (1999), Team SMB (1998), ESS South, Coca-Cola Banditz (2005), and Polylite Mafia (2001). The festivities were hosted by Maguire Sports organizers Chris Monteron and Mias Posadas at centre court who greeted all the guests who graced the event, Dr. Josefina Suarez, Ed. D., ESBL Commissioner Ferdinand Alido, PTA President Vic Turdanes, Ms. Anna Alido, Academic Directress Ms. Ligaya Quiambao and PBA players Gerard Francisco and RJ Rizada of the Coca-Cola Tigers. The opening prayer was led by Academic Directress Ms. Ligaya Quiambao, who asked the Lord for His guidance during the games as the athletes take the court, that win or lose they may hold their heads up high. After the prayer, the athletes remained standing as the National Anthem was sung by the Seton Minstrelles, echoing their beautiful voices across the halls. They also led the Seton community in singing the Seton Hymn soon afterward. The ESBL 2008 was formally opened by Dr. Suarez who welcomed all the alumni, familiar faces while growing up, and thanking them for joining the league and supporting the Seton sports program. “Building the Seton community is our objective. As the Seton network expands, we want all Setonians to have the bond that will set us apart,” Dr. Suarez says. Dr. Suarez also gave the alumni the vision of the Seton Sports Development Program, one whose vision is geared towards athletic development of the school. “Always remember that in Seton we strive to become servant-leaders, as we strive to make a difference in our community,” Ms. Suarez adds. Each of the teams were then called to centre court led by their team captains to shake the hands of the other teams in a gesture of camaraderie and sportsmanship amongst the teams. The program then continued with a talk by Parent-Teacher Association President Mr. Vic Turdanes, who spoke of the league’s humble inception. The support of the ESBL Committee was applauded as well. After Mr. Turdanes’ talk, League Commissioner Ferdinand Alido led the athletes in reciting the Oath of Sportsmanship. The athletes were represented by Mr. Chris Conwi (Coach – Sunflex) and Mr. Louie Lara (PTA Representative). The festivities kicked off with the first event, the Ferlette Three-Point Shootout. PBA players Gerard Francisco and RJ Rizada opened by shooting their threes. Each team was represented by their best shooters and after the first round, it was Polylite’s Hero Zaide who came up on top with 9 points, followed by a 4-way tie for second place in Matt David (Ellegy H20-2k7), Mr. Santos (Sunflex), Sir Dan (Ezerra Legends), and Albert Rivera (Coca-Cola Banditz). During the final round it was Albert Rivera who came up on top, besting all the other shooters. Ferlette Multivitamins is one of the presentors of the league. The festivities took another spin as the next event, the Coca Cola Shooting Stars Challenge, started. Three representatives from each team were tasked to shoot balls positioned in different sides of the court in the least amount of time possible. Although the Coca-Cola Banditz came close, it was the Polylite Mafia 2001 who came up on top, with their record time of 1min and 10 secs to finish the challenge. The final event in the festivities was the Seton Half Court Challenge wherein 50 players from all teams were dared to make a half court throw for the chance to win P2,000 worth of Coke products. Nobody could make the halfcourt shot until Coca-Cola Tiger RJ Rizada made a heave (without even jumping) from half court and swished it in which sent the crowd to their feet in applause. To close the ceremonies, the ceremonial toss was led by League Commissioner Ferdinand Alido and closing remarks were delivered by Coca-Cola Tiger Gerard Francisco who urged the players to continue their love for the game and advised the players to be proud in victory and humble in defeat. 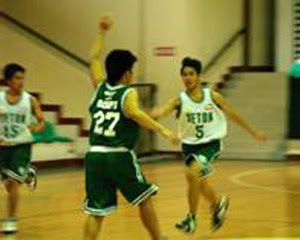 In a game that featured high scoring hoop action and rivalry between both Seton Varsity Squads, it was Ferlette-Seton 2008 who notched a win over their senior counterparts Ellegy H20-2k7 during the first game. Ferlette started with guns ablaze, leading by as much as 22 points during the first half, with literally no response from Ellegy H20. 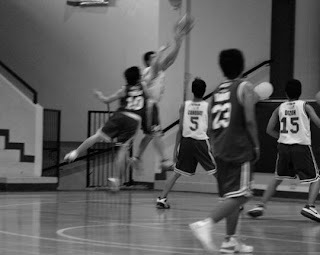 Dizon led all scorers for Ferlette with 29 points and added 7 boards. Ellegy H20 was led by Monsale who turned up a monster game, with 30 points and 20 rebounds. David added 24 points and 4 assists. However, during the second half, Ellegy H20 surprised the juniors with a stifling press defense, forcing turnovers and quick conversions on the offensive end for the team led by Matt David. With Lester Cacapit and Monsale in the frontcourt, Ellegy H20 outrebounded Ferlette in the second half and controlled the paint from then on. With the clock winding down, the 2007 boys forced a deadlock and and with 5 ticks remaining, David took a shot from fifteen feet which rimmed out, forcing the overtime. In overtime, Ferlette took the lead and without team captain Matt David, who suffered cramps midway through the overtime period, Ellegy failed to capitalize on the momentum and eventually collapsed in the end game. “It was great for our boys to win it. I’m happy that they were able to run the plays well and win despite the pesky defense of 2007,” says Jolly Escobar, head coach of the Ferlette squad. ad. In what proved to be another classic game in the making, Sunflex put a halt to a late fourth quarter rally by the Coca-Cola Wrath VHU led by their team captain Mico Manalo, who scored 4 straight points in the last 2 minutes to tie the game with under a minute to go in regulation.